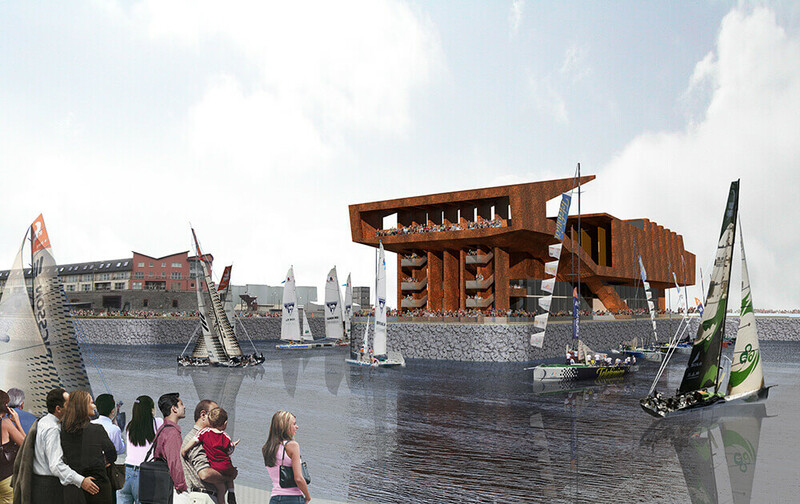 The site location on Central Pier allied with the historic marine heritage of Galway harbour justifies a building that is an iconic landmark and a focal point for visitors and local people. The need to respond creatively to the place and its marine heritage encourages response to context as a key design generator. 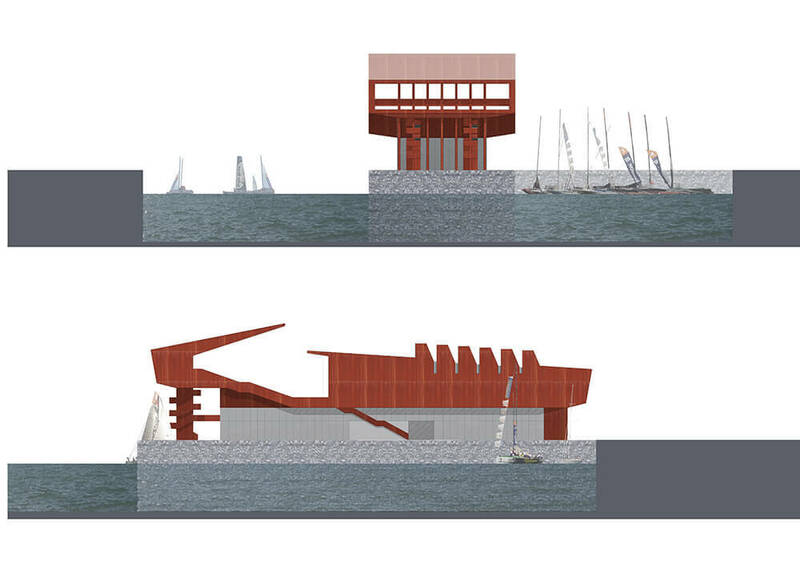 The proposal adapts the existing dimensions of the existing quay as governing rules for the buildingís form, and therefore reinforces the function of the quay as a berthing place for boats. It was important that access to all edges of the dock was maintained for marine activity and for casual visitors and spectators. The second restriction was that the building did not overhang the edge of the quay allowing tall ships to berth along the edge without interference of the building. 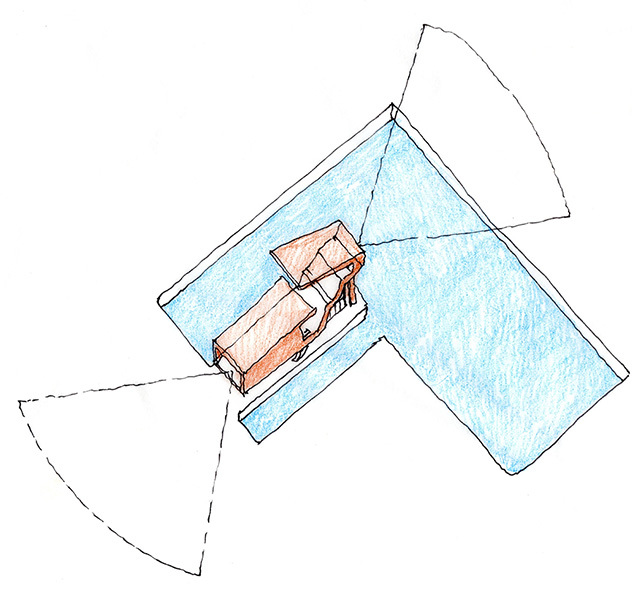 The third requirement governing the building size and location was the desire to leave a clear arrival square on the sea end of the quay. The form of the building derives from these established setting out lines. Lower floors are set back from the quayside allowing continuous access to the quay edge. The main building form above is built to the edge of the quay and is modeled to reflect the section of the building. 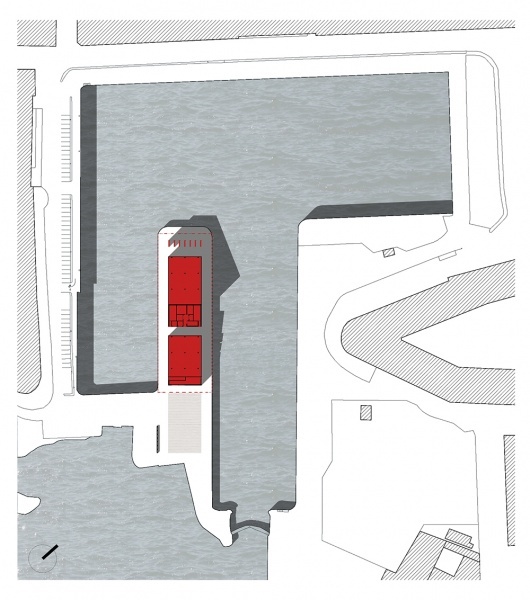 The commercial requirements of the brief are arranged in the base of the building in a long rectangle providing commercial frontage along the length of the quay. The space provided is sub-dividable flexible and adaptable for various tenancies including shops bars cafes and restaurants. The office accommodation, which is placed on the first floor allowing views across the harbour, is shaded by the overhang of the building above. By placing the office accommodation directly above the commercial space the possibility for tenants occupying two floors is kept open. A central core serves the offices. Marine facilities and public toilets are located adjacent to the lift forming a service block for the building on the ground floor. The main form of the building the exhibition and spectator spaces are housed in a single metal clad form that cantilevers over the base below providing shelter to the quayside below. Two generous stairs provide access to this level. The stage is placed centrally on this floor. On the seaward side a square roof-lit room provides flexible space for exhibition events and other functions. The exhibition hall has a grand double-height window with large balconies that addresses the arrival square and the open sea beyond. On the town side the arena is formed under a singular cantilevered roof. Raked retractable seating is provided on two levels and stored under balconies. To the rear of the arena a series of open galleries provides viewing platforms within a large window that overlooks the harbour area. Two stairs connect the balconies to the quay level below. It was important that the exhibition and spectator spaces formed a fluid continuous space that could be used together allowing a higher level of flexibility of the facility. On special days such as the Volvo boat race attendants should have open access to all of the upper floor and avail of views out to sea and over the harbour area. The expression of the commercial element of the building is discreet and low key, but with maximum permeability to the quayside. A recessed glass wall is wrapped around the space, which is sheltered by the form of the building above. The structure of the base consists of large circular concrete columns on piles that support a cantilevered concrete raft 7metres above quay level. The structure is set well in from the quay edge avoiding damage or disruption to the existing quay walls. It is intended that the upper part of the building can be seen from afar, presenting a strong and distinctive image against the backdrop of the buildings that line the harbour. Rectangular in plan the form is modeled as an extrusion, articulating the cross section of the exhibition hall and spectator arena. The resultant form is clad in steel panels with a robust building profile to the sea and within the harbour. The structure of the upper levels consists of a steel frame built on top of the concrete raft below. The roof is a cantilevered steel structure with steel deck and cladding.